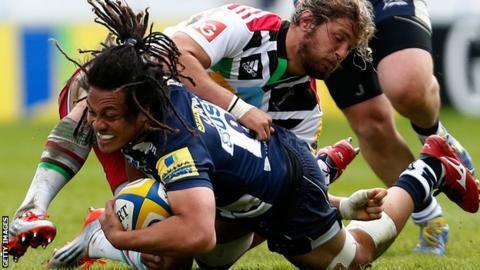 Sale Sharks forward TJ Ioane is happy with the challenge of adapting to the openside flanker position this season. The Samoa international, 26, moved to the Sharks in January on an initial short-term deal before signing a two-year contract soon after. Iaone predominantly played as a number eight or blindside flanker in New Zealand but has started two Premiership games this season at openside for Sale. "It's a new role for me, I don't really play seven," he told BBC Sport. "From where I'm from I usually play six or eight because sevens back home are a lot fitter than what I am. "For myself I guess I could add another string to my bow saying I can cover seven now." Ioane, who played for the Highlanders in Super Rugby, was given some time off before the start of the season after he played twice in the Rugby World Cup for Samoa. One of the biggest differences Ioane has noticed since his move to England is the preparations before the game. "I've come from a place where weights are part of the week, but it's not overly focused on, here the lads are a lot bigger than what the lads are like back home. "I guess because of the fields and the conditions it becomes a forward-orientated game here so I'm about this same size as some of the academy boys. "If it affected my game then I might have to get bigger, but I like playing at the weight I am - for me the bigger I get the harder it is for me to get around the pitch."